16. 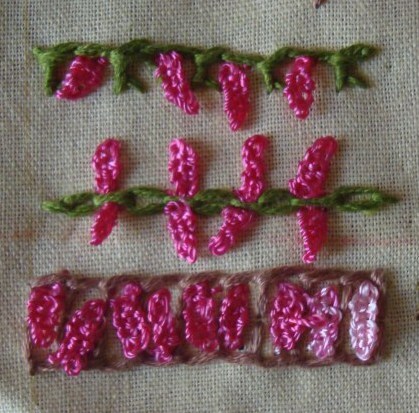 In the first row, the woven picots are worked between bonnet stitches, in the second row with cable chain stitch and in the third row with buttonhole variation. 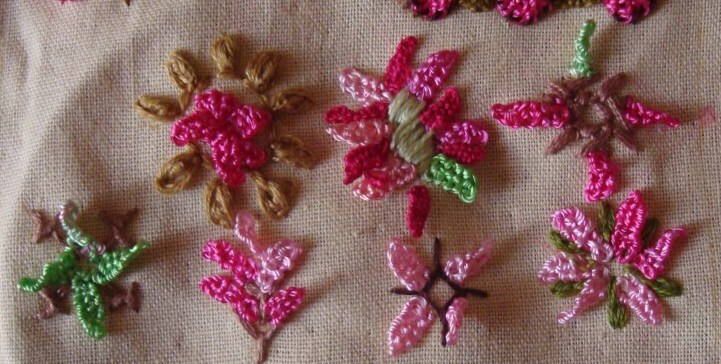 17. the first row, the woven picots are with basque stitch, second row has Pekinese stitch and woven picots, the third row hedebo stitch, instead of beads, there are needle woven picots. This is a wonderful stitch, though I was practicing the stitch throughout the sampler! Wish I get to use this stitch on my projects. 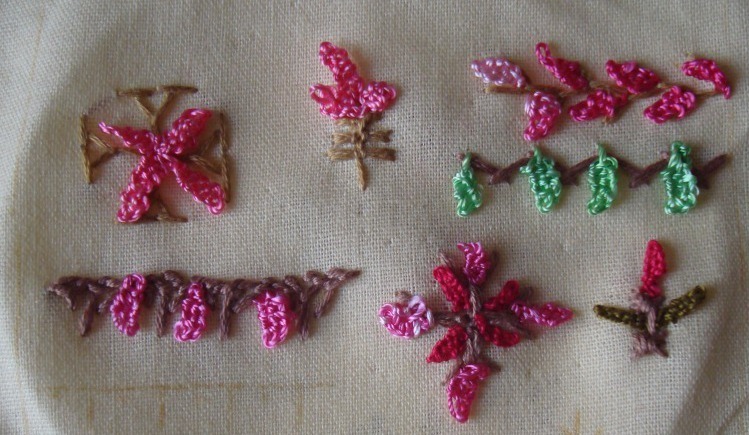 I tried a few motifs with needle woven picot leaf stitch and other stitches. 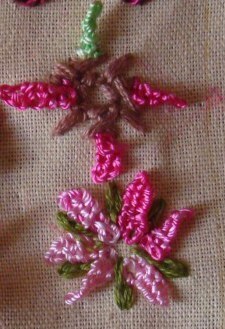 13. the motif on top is worked in the centre with five needle woven picots and outlined with oyster stitches. 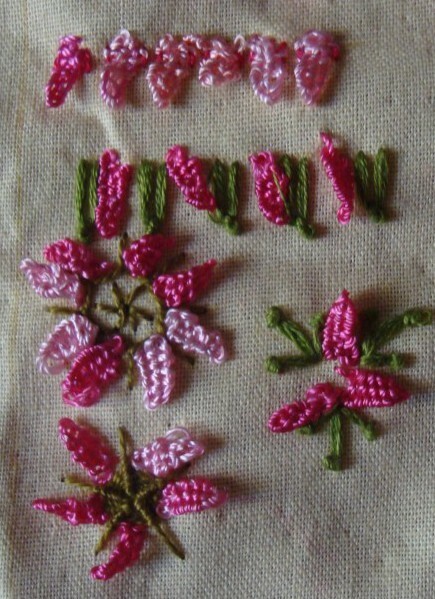 The motif in the left is worked with isolated knotted loop stitch and the right motif is worked with fly stitch. 14.The centre of the motif on the top is worked in satin stitch. 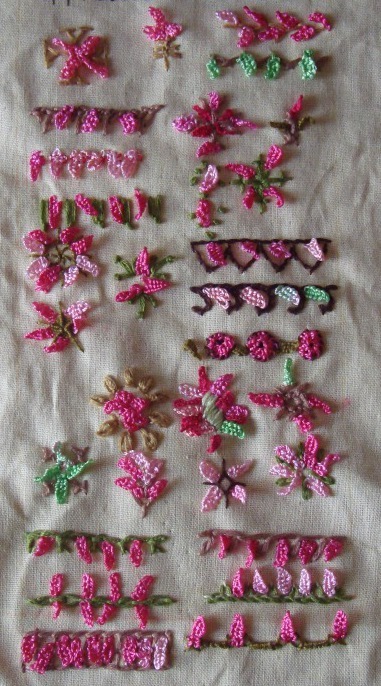 The picots are worked in perle cotton and cone thread alternatively. The woven picots are worked over cretan stitch variation in the bottom motif. 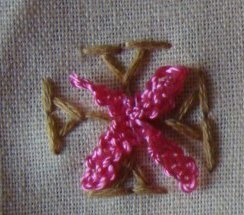 15.the centre of the top motif is worked with crossed buttonhole and buttonhole variation, the picots are worked over the crossed stitches. 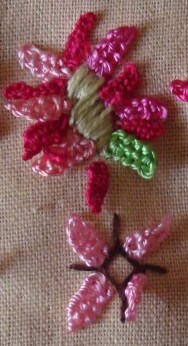 The next motif is a combination of needle woven picots and detached chain stitches. 10.In this part of the sampler, the first motif is with French knots and in the second one , needle woven picot is worked with Algerian eye stitch variation. 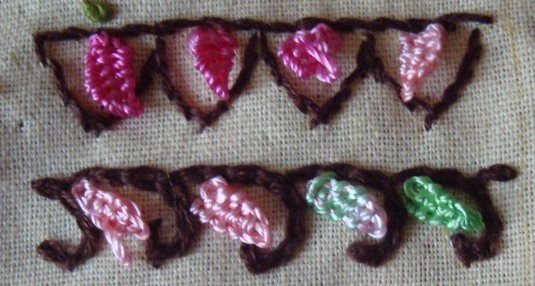 11. the first row is outlined with stem stitch and the curves are worked with chain stitch in the second row. 12. 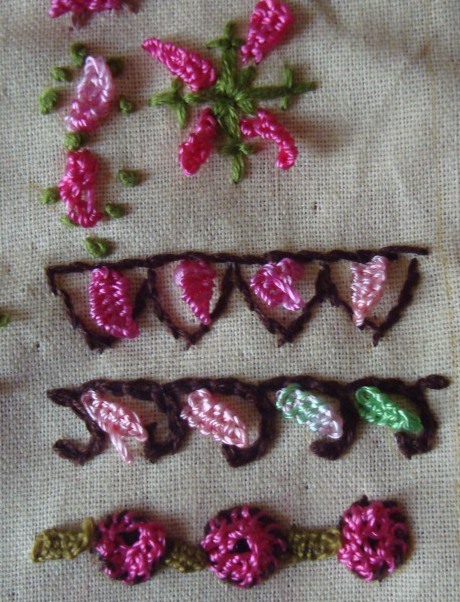 Though I haven’t started last week’s buttonhole wheel cup , it is used in this row with needle woven picot leaf stitch. Today I worked this stitch with few more TAST stitches. The progress on this sampler is very slow. I am still in the learning process. 7. in the first sample, I worked two straight stitches , and then started the picot, including the straight stitches into the weaving process. The second sample is worked with Italian border stitch. 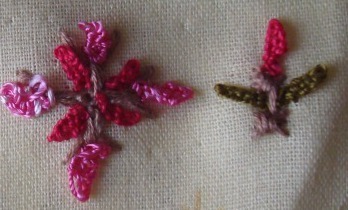 8. these two motifs are with buttonhole and whipped wheel stitches. 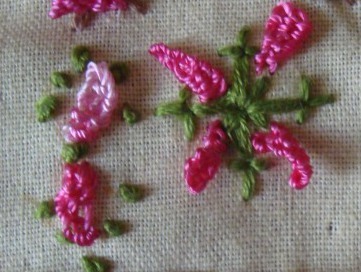 9. needle woven picots with triple pistil stitches are worked in this motif. It looks as if this this stitch challenge will continue next year also. I am looking forward to learn and explore more stitches. 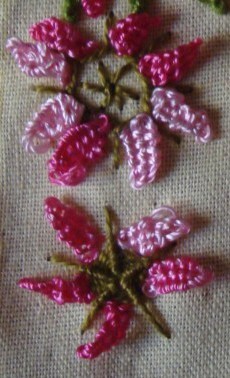 This week’s stitch is needle woven picot leaf stitch on the TAST 2012 challenge by SharonB. We had holidays last week, which we spent by visiting some countries in eastern Europe. I did not work last week’s buttonhole wheel cup stitch. 1. This stitch is worked with half chevron stitch. 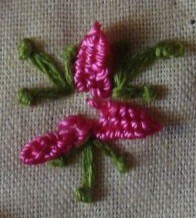 2. three needlewoven picots with up and down buttonhole stitch. 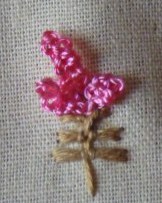 3.woven picots with feather stitch. 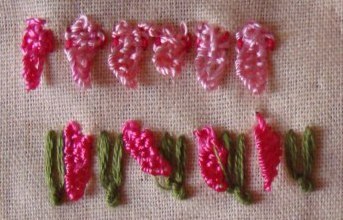 4.needle woven picots are worked with herringbone stitch. 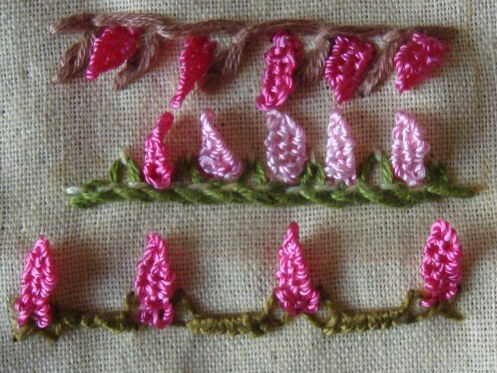 5. three needle woven picots on feather stitch variation. 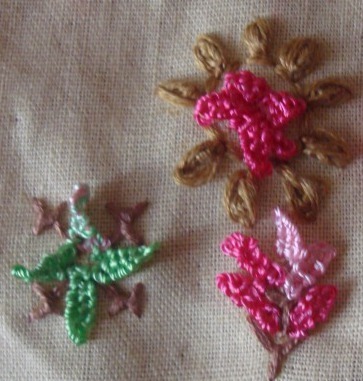 6. needle woven picots in two colours over wheatear stitch motif and leaves and flower[!] worked in this stitch over butterfly chain stitch.